During this political climate immigrants are surrounded by uncertainty and fear. Even green card holders are worried about their status and fear deportation. There is a growing need for accurate and up to date information about immigration policies and remedies. MI offers various legal and immigration workshops, community events and courses. 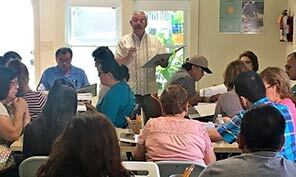 MI’s Naturalization Course prepares a cohort of 10-20 green card holders who qualify to apply for citizenship by offering them exam preparation assistance, individual guidance through the various steps needed to apply for naturalization with the United States, interview practice and application assistance. It is an intensive 5 week course done completely in Spanish. Each course concludes with a legal clinic to assist the participants in completing their naturalization application. 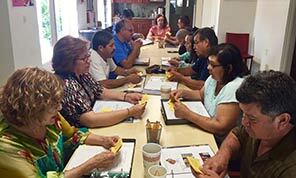 Immigration community events and workshops are regularly scheduled at a larger scale to serve as many individuals as possible. Community events may take place at an MI office or with a partner organization. Free legal clinics are offered at MI’s Berkeley and Richmond offices every other Wednesday afternoon. Individuals can call to make an appointment at the corresponding location and pro bono attorneys (collaborating with MI) are available for individual consultations regarding any legal/immigration questions. The attorneys will then provide legal advice and a referral when needed. To increase health awareness and access to services, MI’s outreach staff conducts on the street workshops, community events, health fairs, and co-hosts on-site screenings with partners throughout the year. Staff also provides health referrals and enrollment guidance when needed. Regular health activities include collaborating with the Alameda County Health Care for the Homeless Mobile Van Clinic which comes to MI’s Berkeley location once a month. 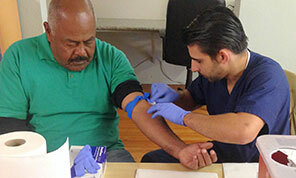 It provides screenings and health services to day laborers, their families and other homeless community members.